This small pine goes way back to when I was a potter, trying to sell them at my first convention in the mid 90’s in Harrisburg, PA. I met Andy Smith there, and we traded a pot for a tree. 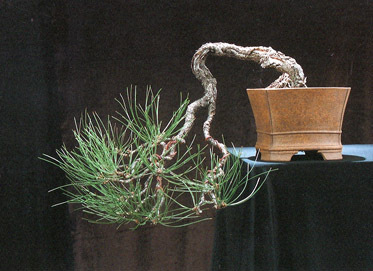 He collected the yamadori pine in South Dakota. For years I grew it as a cascading ponderosa, and grew increasingly disappointed with the look of it. About 8 years ago I put 10 black pine grafts on it. This was when I lived in Arizona. 9 took, 1 died the second year, so I ended up with 8 grafts. Definitely overkill. Then I left for Japan. When I came back I had a strong little tree that my friend Gary Wood had kept for me in Alabama. I ended up keeping only two of the grafts, so all the foliage it now has is from just two scions. This winter I began looking at it again and thinking it was time for a rather major review. This is what I came up with. I don’t think it is in any way a ‘special’ tree of importance, but I’ve been casting about for things to do with small ponderosa that give us more latitude and creativity, and grafting seems one option. This has been my experimental tree… and I’m grafting more these days as a result of the fun I had with it. The original pine ‘as a ponderosa’ back in about 1999. All black pine now, growing with wild abandon on styling day. Sir Hawthorne, and so became the Swan. I really like it! Nice to be able to shorten the needles so. Do you plan to bring the soil level down next repotting or keep it mounded like that? What does it look like from the sides or the back? I am not a fab of the pigeon breast and am wondering if a view from the left (about 75 degrees from the current front) and about 15 degrees above the current planting angle will look. Probably much more traditional, but might be interesting. Sadly it is not much from the sides or back. There is one simple s curve on the side you mention. So, when lacking interesting options, I chose to use the pigeon breast. Actually there are a lot of them in Japan. It’s not avoided… just presents a different feeling. Hello, thanks for your work and for sharing it on line. I’m learning quite a bit from reading your posts. – I have a couple of questions though… I live in Wyoming and have started collecting some ponderosa. I’m very interested in grafting different pines to it but have a few reservations. Ryan Neil has shared about how some growers are running into issues with certain white pines grafted to black pine; because the specific white pine species used grew faster than the black and separated at the graft after as many as 10 years. Isn’t black pine more vigorous than ponderosa? And if so could this be an issue down the road? – Any other advice would be greatly appreciated as I’m very interested in attempting to graft different species to ponderosa and limber pine. 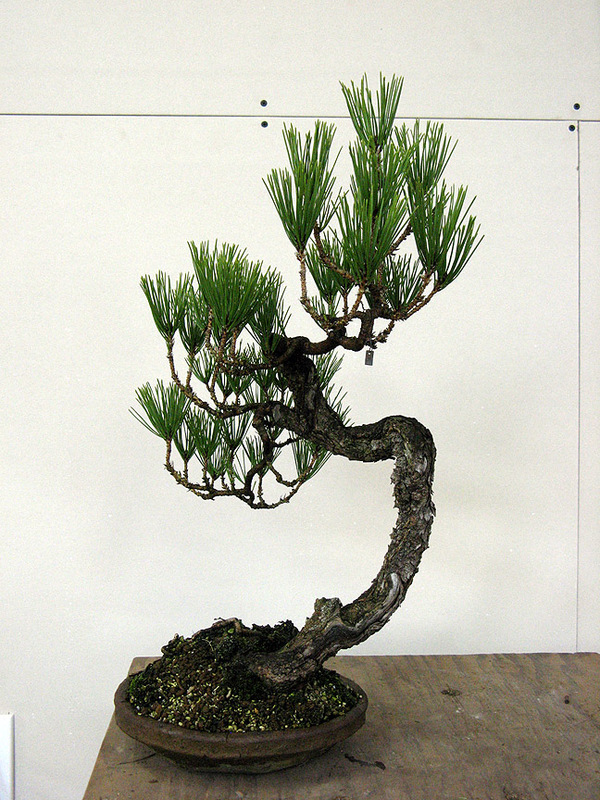 Yes, about grafting pines onto ponderosa for a more refined foliage type— this is something relatively new. 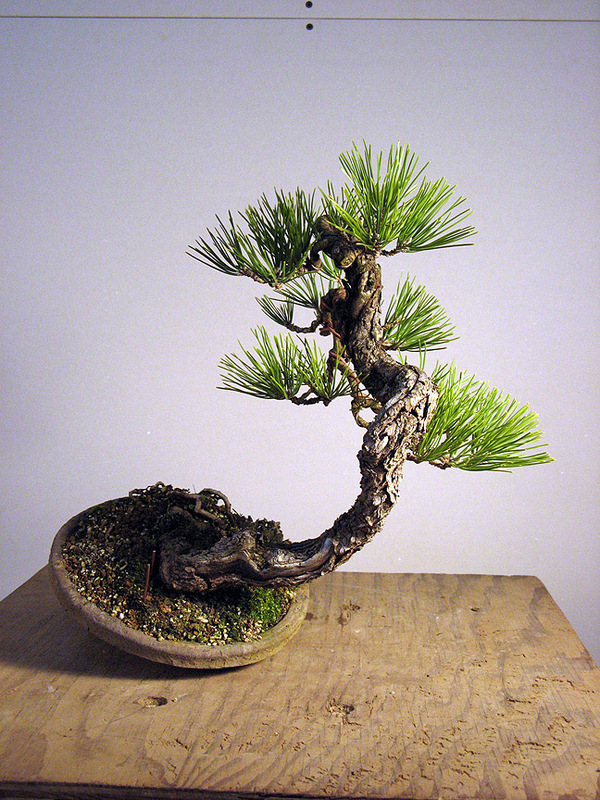 The tree I posted is not showing any bulging problems, and was a Mikawa black pine scion. But then I’m not growing it that hard either. 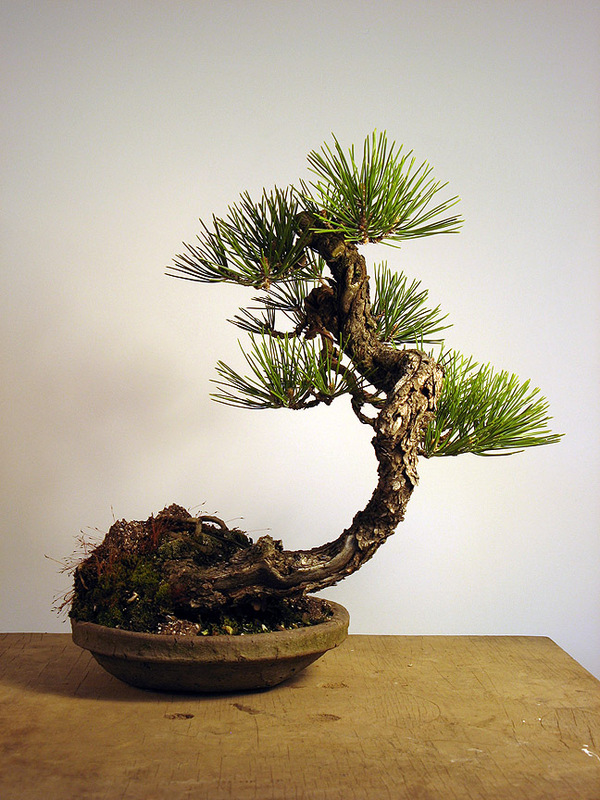 I think if you grafted a variety of black pine such as ‘benchoho’, which is a thick-shoot dwarf, it is possible you may have problems later down the line. Also multiple grafts on the pondersosa would limit problems in the future if you’re not relying on a single graft for the tree. Bear in mind that some grafted pines do exceedingly well for centuries. The Tokugawa white pine shown in the large book ‘The Classic Bonsai of Japan’ on the first color plate is a grafted tree—and that tree is 400 years old! It was grafted onto black pine. Just a good scion/stock match. We don’t have that kind of history yet with ponderosa pine, but care taken to avoid too strong—or weak— a scion plant is just wise. Thanks! That helps a lot. I’m excited to try some different species here soon! Accents are where we can get really creative—truly do try anything that inspires you! When it comes to display sometimes we’re a bit more limited in terms of what looks good with such and such a tree, etc., but many accents are really grown to be and to exist on their own. They need no supporting cast members. A clump of bamboo. Cattails. Some strange creeping thing with a curious flower that you saw down by a stream— take them home and dream up containers for them. Containers need not be—often should not be—traditional bonsai pot forms. Get creative there too. One of my favorites is potted in a metal water meter cover. Don’t tell anyone. Accents are about having fun. Sometimes our fun and our epiphanies mesh and something truly wonderful happens. So you said you became disappointed in the original PP. May I ask why? I’ve heard they backbud and the needles shortened over time. Am I mistaken? Also, why do you plan on leaving that mound? Style decision or practical decision? Ponderosa pine is an interesting pine. It does backbud, needles do shorten with time in a pot and ramification. The problem is that they look best on larger trees, being a coarse foliage tree, and there are so many smaller ponderosas that look wonderful too. So the choice to graft black and sometimes red pine onto them is partly to make a more refined future tree that will be in scale. The mound is a practical decision because of the roots— I rather like it, as well! A good friend of mine is a sculptor in clay, and he uses necessity as a working methodology. His sculptures are huge and heavy, and need buttresses and such to keep them in the air. So that becomes part of the work that he does not remove. I agree, sometimes practical has its own sense of ‘rightness’. And doing anything just because we can—over manipulation—is a dangerous path to get familiar with in any walk of life. That reminds me of that plant that Kimura did where he used I think, 2 vertical pieces of stone, one supporting the other. Very ingenious and a lovely composition as well.